When everyone looks at their smart devices or takes a nap, I will whip out my iPad or sketchbook and pens to draw them when they least expect it. A friend told me she was afraid that she might get caught in the act when she sketches them and there might be dire consequences. 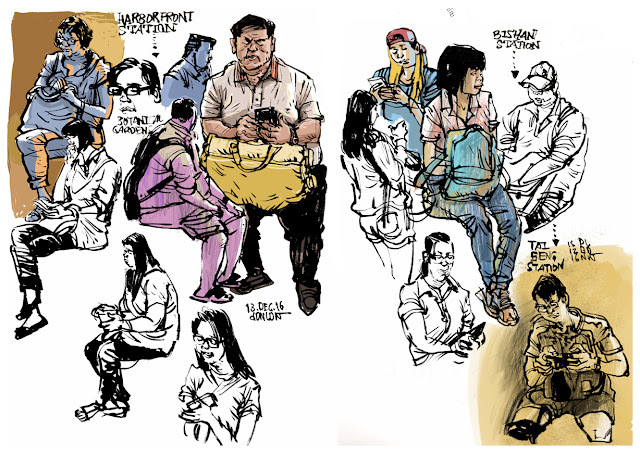 We gave it a go and I asked her how she thought of the whole thing of sketching commuters. No one took any notice of her, she replied. It sounded as if she was disappointed with the outcome. I said, exactly, no one would take notice of you and what you do. Everyone is too engrossed with themselves and their smart devices these days, or they would simply turn away and mind their own businesses. There would be a rare occasion that someone might see what you do but usually the response is positive. I have a few people coming to me before they alight the train to tell me that they like the drawing, but that doesn't happen all the time. I would prefer to be left alone to do my own thang. You don't go around looking at what people do with their smart phone right. Sometimes I thought why would they think that drawing on the train is a public performance. Like I mentioned before, I have been using my brush pen to draw on the go very often now. It allows me to fill in the blacks and I usually start drawing the hair (shapes) first before going to the ear and then to the face. Sometime its the gesture that I started first, which is the curve of the back or the front of the body to nail down the pose, sometimes I began with the face if the passenger or the commuter is up close, like drawing a portrait. Ink flow doesn't better, so using a used brush pen might be advantageous because you don't want too much ink to come through to the bristles. Dry brushing is also good to add some tones to your drawings. Comparing brush pen to iPad's Procreate, I prefer brush pen. Simple reason is, the outcome is always unpredictable, while the brush strokes are a lot more gestural and energetic. I am in these books. No images created by Don Low in this blog may be reproduced for publication or mass distribution without written consent by Don. Send me an email if you wish to use any images here.